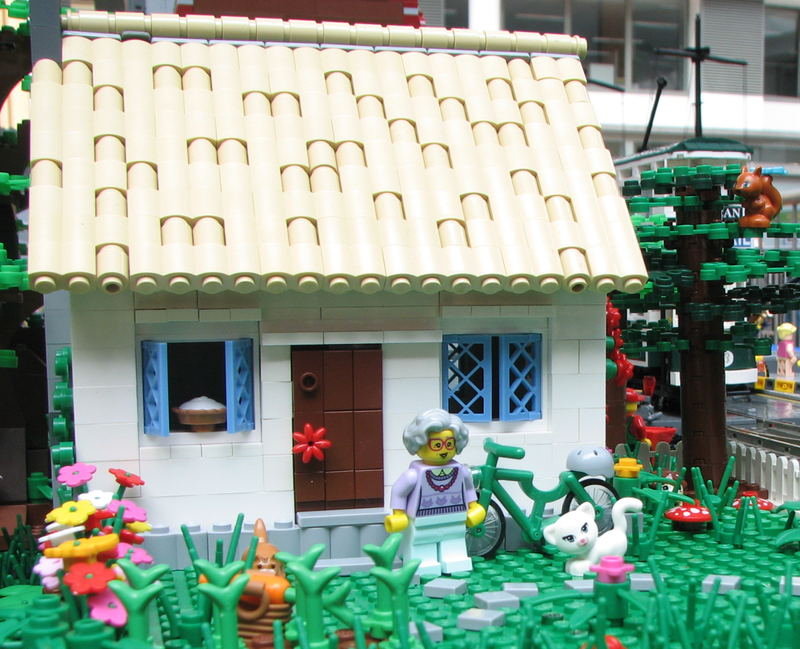 A granny cottage in an ideal world. 🙂 Photo by Dfenz (Creative Commons). Back in April of 2015, owners of granny flats, in-law apartments, and backyard cottages in Santa Cruz, California, got an alarming letter from the city planning department. The letter suggested the deep civic promise of those grassroots housing types, collectively known as “accessory dwelling units” or ADUs, was threatened by the burgeoning phenomenon of short-term rentals via agencies like Airbnb and VRBO. The Santa Cruz City Council planned to debate a proposed ban on short-term rentals in ADUs. As a researcher on housing and environment, I found the letter fascinating. It was odd an American city was thinking of ways to rein in ADUs, as if granny flats were somehow getting out of control. Despite much noisy debate about the idea of ADUs, very few have been permitted and built. In my home town of Portland, Oregon, probably the ADU capital of the country, permitted ADUs are about 0.5% of all housing units, as I’ll show later on. Moreover, Santa Cruz was known for actively promoting ADUs. The letter echoed some points often made in their favor. A ban on short-term-rentals in ADUs was adopted by Santa Cruz later that year, with some pre-existing short-term-rentals grandfathered in. But will it actually make more housing for local residents? It’s definitely not as simple as it sounds. Sample output from my interactive model. Try it! This material takes a while to get through, because the conversation about ADUs and short-term rentals (STRs) is filled with unspoken assumptions. I will have to state those assumptions clearly to see if they make sense. There are also key pieces of missing data that really deserve formal, funded research, which I would like to conduct. Until that funding materializes (email me if you’ve got an opportunity 🙂 ), I am stuck with the imperfect sources we have. In this article, I perform a thought experiment for Portland, Oregon, mathematically modeling the long-term effect of a completely hypothetical ban on STRs in Portland ADUs. I express the model in an interactive web application, where you can set the input parameters. The number of ADUs that can be converted from STR to LTR use has definite mathematical limits. ADUs are not equivalent to STRs. There are currently 1666 “whole-home” Airbnb rentals in Portland, but only a fraction of them (about 200 is my estimate) are permitted ADUs. ADU uses change quickly and easily, which is one reason homeowners create them, but LTR is the dominant or “fallback” use. If STRs were prohibited, the production of ADUs would decline somewhat, leaving less available to become LTRs. Read on for the full details. My model still leaves a range of possibilities, but the best way to narrow them is to collect better data. If you’re interested in qualities of Airbnb listings in nine global cities, but without any focus on ADUs, check out this piece in Planetizen. At first, the Santa Cruz ban seems like an obvious thing to do. Isn’t it logical to presume that if one use for ADUs is banned, the number of ADUs put to permitted uses will climb? In the very short term, yes. But in the long term, the picture becomes a lot muddier. You must consider not just the percentage of ADUs used for housing, but the reason homeowners create ADUs, and the way ADUs change uses. I decided to look at those factors. I made a thought experiment: if Santa Cruz’s rule was implemented in Portland in 2016, how would it affect the supply of long-term residences in ADUs in 2026, ten years in the future? Such a ban has not been discussed in Portland, to my knowledge. But short-term rentals are starting to creep into civic debates about ADUs nationwide, and Portland is a good “venue” for testing. Portland, like Santa Cruz, allows short-term rentals (STRs), and separately promotes ADUs, but has more data about housing and ADUs to the matter in perspective. With Portland in mind, I looked at a number of questions that should be asked by any city considering the relationship of ADUs and STRs, such as “how long-lived are STR listings?” and “why do ADUs change uses?” I then used this work to inform the input parameters for a mathematical model, predicting how many ADUs will be used as LTRs in 2026. Full disclosure: I have had an ADU on my personal property for about 9 years. For about 2 of those years it has served as a short-term rental. I have the relevant permit from my city. I’m also confident I can examine the issue fairly. There is no regulation being discussed on the topic in Portland, as far as I know, that would affect my finances. More important, I’m one of the very few people around who has published data-based research about real ADUs – whereas most writing on the topic (except for accessorydwellings.org, of course) simply rehashes other opinions or policies. Here is one example of my work, and another. I hope you’ll appreciate the formality of my approach. The point of my piece isn’t to give a final answer, but to start a rational discussion. I presume everyone reading this has the same goal: to maximize the number of ADUs used as long-term-residences (LTRs) — or, to contribute to informed public policy decisions leading to that result. You probably know ADUs are small, self-contained cottages or apartments on the grounds of otherwise typical single-family houses. ADUs typically exist within “single-family-residential” urban neighborhoods, and have a modest, traditional architectural form that many people find appealing. But several more details distinguish ADUs, and have great consequences. An ADU is not a separate piece of real estate; it has the same owner as the main house (with very rare exceptions). ADUs are usually created and managed by homeowners, not professional real estate investors. These homeowner-developers don’t have the same skills or priorities as professionals, which can be a good thing, because their priority isn’t always profit. Though ADUs are designed and permitted as housing, it is possible and often legal to use them in diverse other ways, for example as a home office or art studio. I’ll divide the uses of ADUs into three categories: long-term residences (LTRs), short-term rentals (STRs), and “other”. The dividing line between “short” and “long” term can be set at various places. I’ll use one month, because that is the effective guaranteed length of the common residential “month to month” lease. One month also matches up with the results from one of the few relevant pieces of survey data. The goal of informing public policy is important because it influences how I address unpermitted construction. I will limit my view to ADUs that are permitted. By permitted, I am not referring to the special permits some cities require for short-term rentals — those are rare, and unstudied. By permitted I am talking about the basic construction and/or occupancy permit that recognizes the ADU as a legitimate and safe dwelling unit, and allows it to be rented out as an LTR. It is true that unpermitted ADUs are numerous (see Table 1 of this review), but from the perspective of informing public policy, they may not be relevant. Homeowners who build or rent out unpermitted ADUs have already decided to ignore local policy. For them, changes in local rules about how they can use their ADUs are likely to be irrelevant. How many housing units can be “created” by converting STRs? The Santa Cruz rule aims to produce LTR housing in an unusual way. New housing is usually created by construction, whether that means building entirely new from the foundation up, or changing a formerly unlivable space, such as a warehouse or unfinished basement, into something livable. In contrast, the Santa Cruz rule aims to create LTRs by conversion of use. That is, it addresses units which are already built and permitted as housing, but simply not being used for it. Creating LTRs by conversion of use may be fast, but it has a natural limit. The number of LTRs created by conversions of use cannot be any higher than the number of convertible units. The big question is, are there enough convertible ADUs out there that a ban on STRs in them would create a meaningful quantity of LTRs? The number we desperately need is the number of permitted ADUs which are being used as STRs. Unfortunately there is no clarity on this. Santa Cruz did not have numerical data on how their stock of ADUs were being used when they created their STR ban, says Alex Khoury of the Santa Cruz planning department, in a recent phone interview. For Portland, there is a relevant survey which I will go over later, but it dates from 2013. Nonetheless I could set upper boundaries on that critical unknown figure, and put the matter in some perspective. 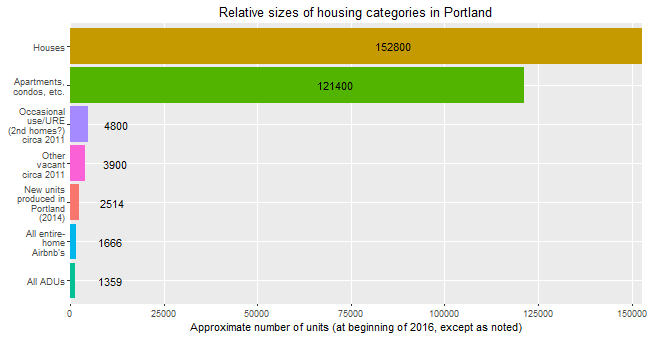 I calculated the number of Portland housing units in various categories, estimating for the beginning of 2016. Some of these categories overlap, so their sum is >100%. Sources: “Houses” and “Apartments…” numbers come from State of Housing in Portland, page 20, which gives numbers to the end of 2014. To estimate end-of-2015 numbers, I added estimated production for 2015, using that report’s 2014 production numbers, and subtracted to account for the total number of ADUs, which are not separately accounted for in that report. “Occasional use/URE” and “Other vacant” come from the most recent (2011) American Housing Survey for Portland, in particular the special Portland city file available in this data package. “New units” comes from State of Housing in Portland, page 20. 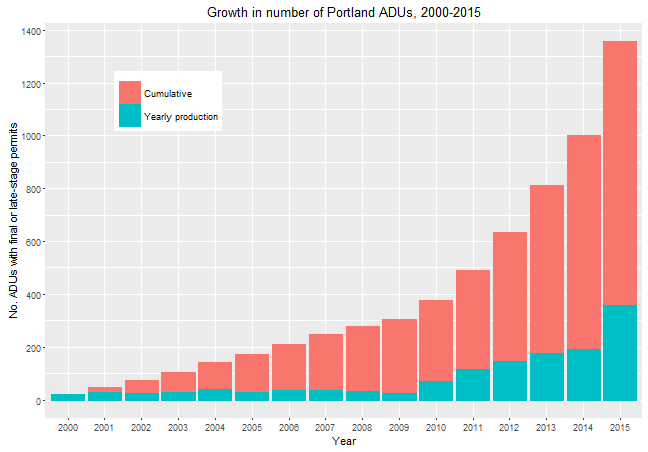 “All ADUs” comes from a spreadsheet of all Portland permit records for ADUs from 2000-2015 inclusive, courtesy City of Portland. I added up the number of permits for which the city recorded the status as “Final,” “Issued,” or “Under Inspection,” which means 1359 might be a slight overestimate. “All entire-home Airbnb’s” comes from an analysis of the insideAirbnb digest of Airbnb listings, dated 2016-01-01. There were 2850 listings in Portland, but 1184 of them are shared spaces, such as rooms in houses. This leaves 1666 listings for “entire home or apartment,” which presumably represent units which could be LTRs. At the beginning of 2016, there were about 275,000 housing units total in Portland, split mostly between 153,000 houses (“single family units”) and 121,000 apartments, condos, and other dwellings in “multi-family” buildings. The total number of permitted ADUs is very small in comparison: 1359, about 0.5% of Portland’s housing stock. Less than 1% of all houses have an ADU on their grounds. If we make the very unrealistic assumption that every single ADU in Portland is used as an STR, and could also be converted to an LTR, the number of LTR units gained would be 1359, increasing the civic housing stock by 0.5%. This would be about half the number of new housing units created by construction in a single year (2514). Another way to set the upper bound for the possible impact of a Santa Cruz-style ban on STRs in ADUs is with the total number of STRs. Looking at the listing database provided by insideAirbnb, I found 1666 listings for “entire home or apartment.” This number includes everything listed on airbnb as an “entire home” whether it is permitted construction, unpermitted construction, house, ADU, apartment, or Airstream trailer. That is, only a portion of the 1666 are ADUs. If Portland is interested in creating more LTRs via conversion of use, STRs and ADUs are not the only possible targets. A look at the American Housing Survey (AHS) for Portland suggests two groups which may be rich in convertible housing units. (Note I have used the version of the AHS fit to Portland’s city boundaries, available in this data package.) While these numbers are dated — they come from before the current vogue in STRs — the numbers are still impressive. In the 2011 AHS, there were 4800 housing units listed as unoccupied, but not on the market for sale or rent, because they were for “occasional use/usual residence elsewhere” — a category often connected to second and vacation homes. Meanwhile 3900 homes were listed as “other vacant,” meaning unoccupied but not on the market for miscellaneous reasons, such as foreclosure, major repair projects, etc. In the context of these numbers, it isn’t clear to me why ADUs should be the focus of discussions about “convertible” housing units. It would be equally logical — and numerically more promising — to look at second homes, homes in legal limbo, and whole-home STRs that aren’t ADUs. How do, and should, housing and business mix? Conversion of use isn’t a new idea, because it happens organically all the time. Check out these pictures from Google street view. A Portland house that was once a church. Two single family houses along a busy Portland street — one converted to commercial use. There’s a natural tendency in urban residential neighborhoods for small business and residential uses to mix together and slip back and forth, especially if you consider uses that only take up a portion of the property. Try looking through the permit and complaint records for your urban residential “single-family zoned” neighborhood, and you’ll get a sense of all the non-housing things people are up to in their housing. Here are some Portland examples, all permissible under current rules. A house with a well-outfitted therapist’s office occupying one floor. A house in a residential neighborhood being used as a “family day care”. An ADU being used as a home office for a graphic design business. An ADU being rented as an STR. All of these examples are similar — they are for-profit businesses with low customer traffic, and they are all architectural spaces that could be converted to LTR with virtually no construction work. This conversion of use could happen naturally, for example if the marketplace made housing a more attractive choice for the property owner. Or it could happen via regulation — for example, if the local government banned therapist’s offices in residences. How long-lived are STR listings? “I predict lots of non-permitted short term rentals, not ‘affordable’ housing,” commented one netizen when Bend, Oregon was considering loosening rules on creating ADUs. It seems trenchant, because it deftly counterpoises a claim made by ADU advocates (affordable housing) with the specter of a corporate juggernaut (Airbnb). But it gives the impression the choice is black and white, and the result permanent. This may not fit with the evidence, because it is not clear how long people actually operate STRs. A study in Chicago looked at Airbnb listings there twice, 18 months apart. On the second visit, 49% of the listings from the first visit were gone. 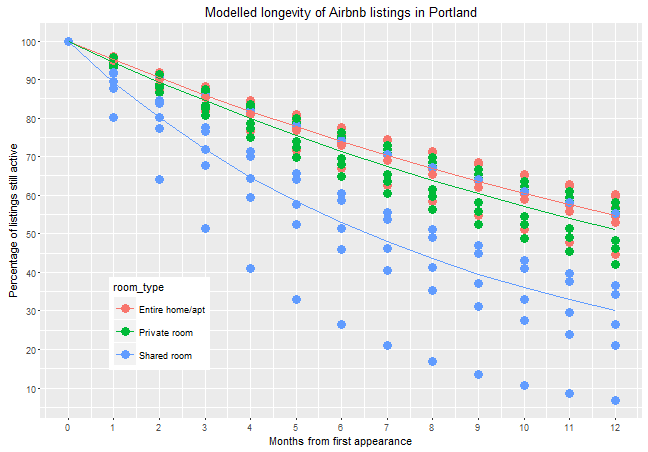 Source and Method: The InsideAirbnb project provided a complete “scrape” of Portland Airbnb listings, for four times from March 2015 to January 2016. I combined all four datasets to see how listings appeared and disappeared. Six specific “intervals” could be examined. For listings active on the first scrape, I could test for their persistence in the second scrape, or the third, or the fourth. For listings active on the second scrape, I tested for in the third and fourth, etc. These six intervals serve as a pseudo-sample, providing six different estimates of persistence for each of Airbnb’s room types. For each room type and interval: I calculated the proportion of listings that existed both at the beginning and end of the interval; calculated a loss rate per day, based on the standard exponential decay formula, and then illustrated the effect of that loss rate over 12 months. For each room type, the line shows the average of the six observations. “Shared room” listings showed a powerful dropoff, with only about 30% of listings projected to last a year — for understandable reasons, perhaps 🙂 . “Private room” listings had more longevity, with about 52% of listings projected to last a year. For entire-home STRs (which would presumably include ADUs), 45-60% of the listings are projected to still be active twelve months after their first scrape, with a mean projection of 55%. In short, the data suggests that nearly half of whole-home listings do not last a year. Running an STR is something that many people try, but less stick with. The data gives us no indication about why many STR listings do not last. Perhaps hosts drop out because operating an STR is a lot of work. It’s also possible that Portland’s STR offerings have become so numerous that there is no financial advantage to operating an STR, when LTR rents are fairly high. Among respondents who were currently using their ADUs as LTRs, a huge majority (about 90%) planned to keep doing so in the future. Among respondents who were currently using their ADUs as STRs, 50% had in the past used them as LTRs, and 43% had used them as extra work or living space for the primary household. 29% of those respondents also planned to use their ADUs as LTRs in the future, and 36% planned to use their ADUs as extra work or living space for their own household. How and why do ADUs change uses? ADUs can be used, and are used, for lots of things. That flexibility is highly valued by ADU owners. The default use, when the owner has nothing “special” to do with the ADU, is LTR. This mercurial nature of ADUs comes about because most ADUs are created and managed by a very unusual type of “real estate developer”: typical homeowners. For these people, creating an ADU can be a major struggle as well as a financial risk, as the case studies often demonstrate. Homeowner-developers typically need strong motivations to push their projects through to completion, most commonly housing a family member, making extra income, or some combination of the two. As these quotes indicate, the homeowner-developers of ADUs usually live on the property and manage it personally. Having nonprofessionals manage a property can at times be a good thing. For example, I found that 15-20% of Portland ADUs were being rented out for rates that were far below market value — all without any subsidy or government requirement. Such homeowner-developers are clearly prioritizing something instead of profit. Likely, it is relationships with family and friends. But eventually there comes a time when household needs change, and the original purpose of the ADU — housing grandma, or providing maximal rental income, for example — is no longer the priority. At that point homeowner decides to put the ADU to a different use. Such changes in use aren’t a surprise to the owner — often, they’ve been part of the plan all along. These visions of adaptability are key to the motivation of the homeowner who is thinking about creating an ADU. It follows that when rules limit the uses of ADUs, it becomes harder for a prospective homeowner-developer to envision a project that seems worth the struggle. And if less homeowners follow through, there will be fewer ADUs around to settle into that default use of long-term residence. How would a ban on STR use affect ADU production? Currently ADUs are a small part of Portland’s total housing stock — the 1359 units are about 0.5% of all housing units in the city. Nonetheless ADUs are an outsized part of Portland’s housing production. In 2014, the 190 new ADUs were 8% of all housing production. In 2015 the production jumped again to 358 units. Source: City of Portland permit records, all ADU permits labeled Final, Issued, or Under Inspection. ADUs have caught on in Portland, but it took a lot of rule-loosening to get there. Rules have a special influence on novice, nonprofessional developers. As evidence, look at the dozens of cities around the country that technically allow ADUs, but in which virtually none have been permitted. To build its stock of ADUs up to a slim 0.5% of housing stock, Portland had to remove most rules and provide a financial incentive in the form of reduced permit charges. Meanwhile, an interesting example of the discouraging effect of use limitations comes from another ADU-friendly city. In 2010-11, Santa Cruz was trying to encourage ADUs. Santa Cruz recognized that financing was a huge barrier for most homeowner-developers. The city thoughtfully established an option for “public funding” of new ADU projects (link at archive.org). However, response was tepid — it is not clear if any ADUs were ever created via the program, though a number were created with private financing. The city soon closed down the public loan program due to “insufficient demand” (page I-16 of this report). For a professional developer, such a commitment might be a mere part of the investment math. But for a homeowner-developer, such a requirement squashes the vision of flexible use. Lina Menard, leader of the case studies project, thinks of it differently. While she hesitates to put an exact number on the reduction, she says that “for about 50% of the people I talk to, having the option of short-term rental is a part of their calculations.” That doesn’t mean 50% of them are planning to operate a short-term rental, she emphasizes, but they see the option as being a positive part of their plan. If that option is eliminated, there are less ways their development can work. My own guess is based on my conversations with local homeowners who are thinking about ADUs and other microdevelopments. What I have heard is that STRs could be a “fallback” possibility if they get into financial trouble, or need to fill in spaces between other, longer-term uses. I’m going to go with a 15% reduction. What is the real proportion of STR use in ADUs? How many of Portland’s 1359 ADUs are used for short-term rentals? This is the key datum needed for a rational conversation about STRs in ADUs, but all the data sources I know of are flawed. It’s possible to look at Airbnb listings and eyeball the number of things that look like ADUs, but this is unreliable because so many listings leave their form and legal status obscure. A lot of listings are likely unpermitted construction. It’s also possible to generalize from a handful of prominent, and new, ADUs, such as the ones on an ADU tour, but that will be inaccurate because it it is clear many STR listings are not permanent, as I showed earlier. Kol Peterson, organizer of the tour, also comments that ADUs on the tour need to have an open date so the ADU can be visited by the hundreds attending the tour — which tends to discourage participation by homeowners whose ADUs are LTRs. What cities, and citizens, really need is a credible survey of all actual uses of permitted ADUs at any one time, where results are broken down into % of ADUs being used for LTRs, STRs, and other uses. Asking about all uses, not just STR, and surveying a large number of ADUs, will serve to average through the tendency of ADUs to change uses frequently. The Oregon DEQ’s 2013 survey of ADU owners is the only source I know of for Oregon. It comes from before the vogue of STRs, but as the only formal survey, we must consider it. Source: tabulation of completed ADUs in the Oregon DEQ’s 2013 survey of ADU owners. Combining three cities (most data was from Portland), the survey found 79% of ADUs were in use (or available on the market) as LTRs, 5% as STRs, and 16% for “other” uses, most prominently “extra room or workspace” for the occupants of the primary house. Right away these results imply some interesting things. If, back in 2013, Portland had been interested in creating LTRs in ADUs via conversion of use, the biggest target for a ban would have been ADUs used for “extra work and living space,” not STRs. Incidentally, those “other” uses come up again in another credible survey of ADU owners, this one from the San Francisco Bay area, where most of the ADUs were unpermitted. Wegmann and Chapple (2012, text under Figure 3) found that 86% of ADUs were in use as or on the market as housing, while 14% had an alternative use. By the current year of 2016, short-term rental activity has burgeoned, but there has been no effort to update the survey, and staff in city agencies are apparently left to guess at the true distribution of uses in permitted ADUs. The best we can do at the moment is to establish a plausible range for the current frequencies of LTR, STR, and “other” use. I will keep the 2013 survey’s estimate of 16% for “other” uses (e.g., extra work and living space) because I see no reason the dynamics motivating “other” uses have changed. For the lower bound of STR use, I will use the 2013 survey’s value of 5%. For the upper bound, I will use a ratio rumored to be used in local planning discussions (though where this estimate comes from is mysterious): 20-30%. I’ll call 30% the maximum credible scenario for STR use. LTR use is what is left over after “other” and STR use. 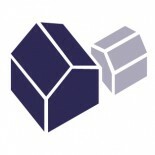 I used accessorydwellings.org’s own case studies as a little reality check on this range, 5-30%. Since July 2014, when the Portland City Council approved its current rules on STRs, the site has published 20 case studies of real ADU projects. In each case author Lina Menard listed the owner’s planned use. 75% were LTRs, 15% were STRs, and 10% had other uses. While this isn’t a scientific survey, it sounds about right: STR use is higher than it used to be, but perhaps not as high as some fear. As a consequence, the number of Portland ADUs currently being used as STRs is somewhere between 62 (5%) and 408 (30%). My best guess is 204 (15%). The most common use of ADUs is still LTR, between 735 units (54%) and 1081 (79%). 216 ADUs (16%) are used for “other” purposes. Will “banned” STRs automatically become LTRs? If Portland enacted a ban on STRs in ADUs, it seems likely that many STR operators would follow the rule. But I don’t think it’s safe to assume that 100% of STRs would immediately become LTRs. As established before, homeowners appreciate the fact that ADUs can fill so many functions, and even without any rules against STRs “other” uses are >=10%. Moreover, some STR hosts would ignore the ban and keep doing STRs anyway. To model the effect of a ban on STRs in ADUs, we need to set a “nonconversion rate” — the proportion of ADUs, currently used as STRs, which would fail to become LTRs under a ban. I’m guessing it will be about 30%, but you can set your own value in the interactive graph. Keeping the last 5000 words in mind, I’ve created a model that projects ADU numbers in Portland over the next ten years. Not just total numbers, but the number used for LTRs, which is what everyone is worried about. You can tweak the input parameters as you like, but the default input parameters are my best estimates. If you want the actual code, email me. Using the default inputs, I see that after 10 years, the number of ADUs used as LTRs with no change in policy is 3308, while the number given the hypothetical ban is 3394. The imaginary ban has helped create 86 units over ten years, which is equivalent to about 0.03% of Portland’s 2015 housing stock. The hypothetical ban on STRs in ADUs has little effect on long-term housing supply for several reasons. First, ADUs are simply not numerous to begin with. After that, the “positive” effect of banning STRs in ADUs is balanced out by the “negative” effects that such a ban would have on ADU production, as well as the fact that there is no guarantee STRs will be converted to LTRs. Though your inputs may differ, it’s hard to find a defensible set of input parameters that produces a gain of more than 500 LTRs over a decade. Some defensible inputs show the ban would actually reduce the number of LTRs. It seems odd that around the country, so much attention has been paid to the notion of reining in ADUs, as if the whole housing form has gotten dangerously out of control. While STRs have dramatically expanded their number in many cities, permitted ADUs have not. Permitted ADUs are an incredibly rare form of development, and they have a lot of unique positive qualities. In cities like Portland and Santa Cruz, with booming markets and housing crises, ADUs are part of that elusive “missing middle” — kinds of development which satisfy the need to densify while they prevent repulsive megadevelopments. ADUs definitely aren’t the only solution cities need, but there probably should be more ADUs, not less. However, cities can’t manage ADUs the same way they do bigger developments, because they are not usually created by professional developers. The homeowner-developers behind most ADUs are unprofessional, and that has good consequences as well as bad. ADU landlords and tenants frequently collaborate on things like child care, shopping, yard work, and other things that make life better, and would never appear in the professional property manager’s handbook. Those positive effects come about because ADUs are so flexible in their use and informal in their management — which are exactly the same qualities that make ADUs suitable for use by small businesses, such graphic design offices or STRs. If cities and citizens want to maximize the long-term housing benefits of ADUs, they may want to learn to love the chaos. With ADUs, it’s hard to ban the uses you don’t like, without also discouraging the ones you do. Thanks for the work, thought and time you put into this. I am in the process of developing an ADU (design phase currently) and my intentions for use are a mix – university student housing throughout the school year, summer guest quarters, with short-term rentals between personal guests. I am among those who would *not* go through the cost, risk and effort of developing an ADU on my property if my options for using it were limited by something like a ban on short-term rentals. I am willing to head into the unknown, because I see multiple ways that I could make it work if one planned use doesn’t pan out. (And it’s critical that the use “pans out” financially, because I’m going into debt in order to develop it, and am leveraging (ie.risking) my personal home to do so.) Specifically, I see STR as a way to weather a transition from one use to another. Let’s hope that our city officials are as thoughtful as you are. A very thorough article and great job attempting — with limited resources — to help demystify the ADU issue. Ours is being built with my mother in law who will age in place downsizing from her larger condo which was getting to be too much to handle by herself. I’m always shocked at how quickly “facts” spouted on forums like “all new ADU’s will be AirBnb” or “there are no granny’s in those flats” get thrown out there ad hoc (also call my MIL a granny and see what happens). The idea people would just casually spend 6 figures on a structure solely to risk it consistently on the potential wanton destruction of an STR tenant always struck me as odd/unlikely. It is primarily the flexibility you mention that makes the investment appealing/justifiable both short-term and long-term. In our case we’re accomplishing several things: freeing up housing options (Her former condo was really a starter single family option which are in short supply), freeing up apartments (She is not competing for those in an already tight rental market), freeing up existing housing stock (She’s not on the market competing for a smaller condo option that could be a starter option for single folks/childless couples) and adding density in a lower impact way that hopefully better integrates into existing neighborhoods as opposed to the giant monolithic apartment buildings (ugly but critically necessary housing) being thrown up around the city, and finally it’s the place we’ll likely live together in the future when my wife and I retire — again freeing up existing housing. Research like the kind presented here is needed to inform Berkeley’s deliberations. Wonderful job on this report, Martin. You address so many excellent points that I wish the Santa Cruz city council would have considered before they voted 4-3 in favor of restricting STR usage of ADUs. This issue was an extremely divisive one for our otherwise tranquil coastal community, and to think that it was started over 14 units(!). That’s the number you were looking for, by the way: 14. That is the number of permitted, transient occupancy tax paying ADUs that were being rented as STR’s when this discussion began. Of the 14 ADUs that fall into this narrow category, over half of the homeowners (we are a small and tight knit group) have publicly stated that their first priority is overflow housing for the occasional family member or guest, and they would rather let the ADU sit vacant than rent it long term. In most cases, the motivation to rent STR in between other, higher priority usages seems more closely related to quality of life considerations than profit. So this presents a double whammy of sorts for the city of Santa Cruz: not only is the community NOT going to gain a LTR out of the use-restricted ADU, but now the TOT remittances from these units will disappear as well. For a city as cash strapped at Santa Cruz, that seems like a move in the wrong direction to me. Another number is one that you hinted at in your article, but I’m happy to make it official: the number of Santa Cruz residents that have taken advantage of the fee waiver program for construction of ADU’s in exchange for renting long term to low income or very low income residents AND observing prevailing wage rules for construction of their ADU is ZERO. That is the number given to me by the administrator of the program. To be fair, the prevailing wage requirement was mandated by the state of California, and is attributable to the funding source used to finance the fee waivers. But the fact remains that there have been ZERO takers for this program (still being offered, by the way) since the beginning of last year. Perhaps most concerning to me is that there is still no mention of the new ordinance restrictions prohibiting STR of ADUs on the actual ADU Permit Application that each homeowner must file with the city’s Planning Department. So it is quite possible that an unknowing, unsuspecting homeowner could enter into the process of constructing an ADU without knowing in advance that their ability to recoup or recover their financial investment would be limited by the amount they could receive via LTR. Very discouraging, and I’m hoping that the city will make the new ordinance restrictions crystal clear to homeowners up front, at the permit level, in short order. Thank you again for your thoughtful and thorough coverage on this topic of importance to so many of us in Santa Cruz! This entry was posted on April 4, 2016 by Martin John Brown in Policy & Trends and tagged accessory dwelling unit, ADU, airbnb, astr, long-term rental, research, short-term rental, statistics, str.